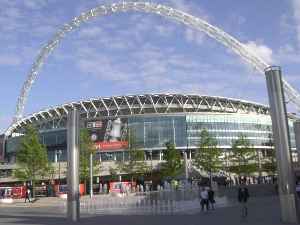 Wembley is an area of north west London, England, and part of the London Borough of Brent. It is notably home to the Wembley Arena and Wembley Stadium. Wembley formed a separate civil parish from 1894 and was incorporated as a municipal borough in 1937. In 1965, the area merged with the Municipal Borough of Willesden to create the London Borough of Brent, and has since formed part of Greater London.